Just took my evening dose of Nyquil to cure me up in time for the big day, so I’ll make this quick. 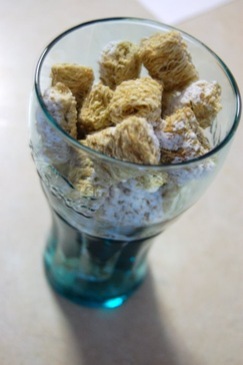 Breakfast in a Coke glass. I’ve got class, indeed. Soup’s the cure-all, so I’ve heard. I had mine with a side of beans, it can’t hurt. Vitamin C, that’s what I need. One hit wonder? 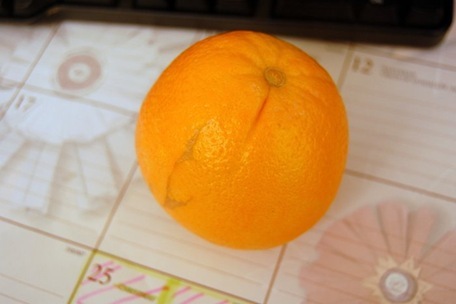 Not this orange. I had two. 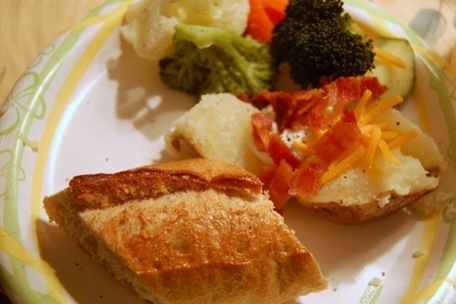 Veggies, bread and bacon? Yes, yes and yes. Paper plate? Once again, that’s just class. 10 minute blog post? Well, that’s a new record. aww feel better girl! nyquil works WONDERS. I hope you get to feeling better! now i am craving bacon. i havent had bacon in 5 months. u might make me become a non vegetarian tomorrow and eat some bacon. I think i just said way too many times for anyones good….haha..
on December 9, 2009 at 12:31 am | Reply Melissa S.
and the dinner looks awesome! as simple as it is! Haha 10 min post is super quick! 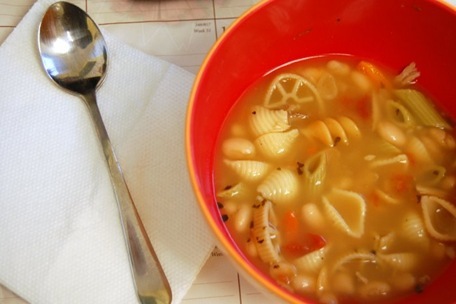 & the soup looks yummy! Get better soon! 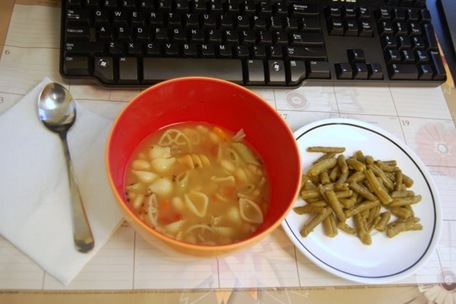 I eat soup ALL THE TIME when I am sick!!! I chugged robitussin last night, aghhhhh! You should make a Nyquil cocktail. Like orange juice + nyquil + seltzer water. This is a horrible idea. I have no idea where my mind is at today. HAHA! Vitamin C! That’s such a flashback to middle school. Oh man, Vitamin C memories haha. Speedy Gonzales is awesome…you need to channel his speed for your marathon! : ) Hope you feel better soon. I remember the Graduation song where there would be singing and random people talking in the middle of the song. So glad that musical trend has died out! put a smile on ya face, make the world a better place. Vitamin C was so legit. I really hope you feel better soon! I’m praying for you.